Grocery lists are something that are nice to have handy at all times because, let's face it, we realize we need things when we go to use them and they are gone. My brother and I both have iPhones and love the web application OneTrip (a mobile grocery list). OneTrip: "What's the one thing you're sure to have on you when you go to the store - other than your wallet, that is? Your phone." 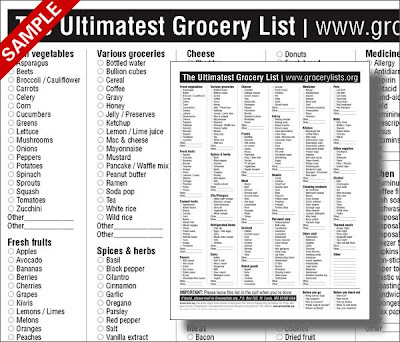 For those of you without iPhones, or traditionalists, head over to Grocery Lists.org for "The Ultimatest Grocery List, a free downloadable PDF." It's pretty sweet, it's a downloaded pdf that you print and then check things off that you need. So, hopefully now everyone can remember what they need at the grocery store, instead of getting home and realizing that you forgot the toilet paper!